Least terns are legally protected in New Hampshire. Possession and take (which includes harming, harassing, injuring and killing) is illegal. Distribution: Few records exist of least terns in NH. Records indicate that 2-10 pairs nested in Seabrook between 1953 and 1960. Least terns are considered rare and non-breeding in NH since 1980. Description: Approximately 9” in length. Slate gray body on top and underneath and a black cap on head. Deeply forked tail and pointed wings are visible during flight. Yellow bill, white forehead patch and small size distinguish the Arctic tern from other tern species. Commonly Confused Species: Common tern, roseate tern and Arctic tern. 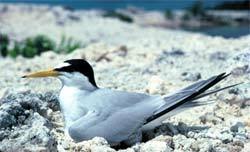 Habitat: Least terns use open beaches and vegetation-free islands for nesting. They prefer sand, shell or gravel substrates, but may use areas with larger stones. Similar to other tern species, least terns tend to nest in colonies however unlike other terns, least terns tend to nest in areas attached to the mainland. Life History: Least terns arrive on their breeding grounds during April and May. They breed in colonies and each pair makes a nest that is simply a scrape in the sand and may be lined with shell fragments. Typically two eggs are laid and both the male and female take turns incubating. After approximately 21 days the eggs hatch and the chicks are able to fly in approximately 20 days. During August and September least terns leave their breeding grounds for their wintering areas.